← Meet the Morte Couture designers…. Yesterday we met Death + Glory to talk about turning preserved animals and birds into wearable fashion. Today it’s preserved flora. The next Morte Couture designer that we’d like to introduce you to a little more is…. Immortal Florals take inspiration from Edwardian bridal crowns and the Victorian passion for preservation, to create delicate everlasting floral accessories. Ruth creates beautiful and timeless fine dried flower creations that will last a life time. 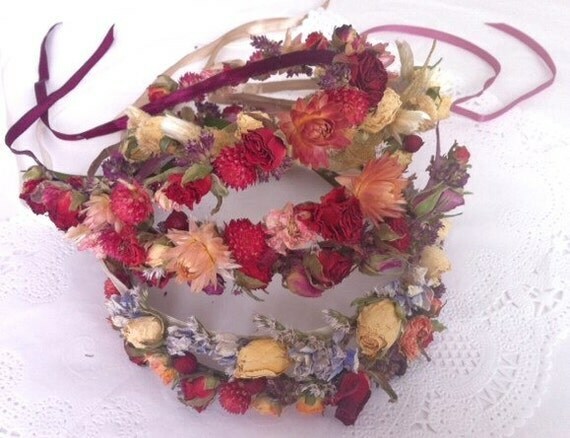 From traditional buttonholes with a twist and vintage hair combs, to bohemian floral bridal crowns. Capturing the beauty of flowers and the moments that they symbolise forever, her preserved floral garlands and hair decorations are ethereal, delicate and nostalgic with a distinctly contemporary twist. Each design is unique, created carefully by hand by Ruth from her North London home -with a bit of help from her cats Indy and Lola! What has led you to working with dried flowers, instead of fresh ones, and starting Immortal Florals? I’ve worked with fresh flowers for many years, and whilst they are wonderful they have huge draw-backs. In recent years floral accessories (hairpieces, garlands etc) have had a revival, but the choices are limited. Dried flowers are a natural, ethical, beautiful solution. And after the wedding they make a gorgeous keepsake of the day – imagine your floral head piece displayed in a vintage bell-jar. What could be a more real, physical memory of the day? “I have a huge fascination with history – particularly the macabre! It never fails to enthrall me learning about different cultures’ & eras’ attitudes to death and the afterlife. Preservation goes hand in hand with this – taxidermy and other ways to preserve life have always been a great source of inspiration for me. Immortal Floral designs shall also be featured at our V & A Wedding Dresses special event, at the V & A, linked to their exhibition about the history of the wedding dress. You can read our whole interview with Ruth in an upcoming blog featured on the Cass Art website. See more & draw the Immortal Florals collection on the catwalk on Tuesday 16 & Thursday 18 September at Cass Art stores for our Morte Couture fashion illustration events. Tickets here. See the full Immortal Florals collection and online shop here. Ruth modelling Immortal Florals Everlasting Floral Crown Headpiece with Delphiniums, Sea-Lavender and Lace.